With Fairway Golf Travel you will always receive a friendly and reliable professional service. Owner and manager Alan Hunter has extensive knowledge of golf in North Berwick and the wider East Lothian Area. He will ensure that you receive a personal service. 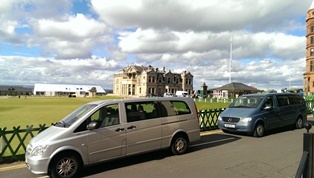 As an experienced ground transportation operator, our services include Meeting and Greeting for visitors new to the area together with corporate and private golf tours. We are very happy with the logistic service provided by Alan throughout the years. His driving is much more reliable than my driving. I can really recommend Alan, should you look for somebody to take you around in East Lothian!